My students (or their parents) will often ask my opinion on which type of guitar to buy. For most beginners, it’s not even a question of brands or manufacturers. It’s whether to get an acoustic or an electric. While I have my personal preferences, I usually bring the question back to them: which guitar is going to make you want to play it? Then we go over the benefits of each. Acoustic. Discussing acoustic guitars often leads to a conversation on body styles and sizes. For children, it’s important to take physical growth into account. A parent is often unaware that acoustic and electric guitars come in three-quarter and half sizes. Although dreadnoughts are widely available, they aren’t comfortable for many people. But before a student rules out acoustics, I always let him know about folk, auditorium, and parlor styles. Electric. Students of all ages find electric guitars easier to finger and form chords. And the enthusiasm of playing an electric can spur many students to practice more often. Three of my young students switched from acoustics to electrics this year and their mothers regularly report that it’s hard to separate the student from the guitar! If a younger student decides on an electric, again, size can be a very important issue. Like acoustics, it is possible to find “student sized” guitars and if a student is particularly young or small, a smaller guitar will usually result in less frustration in terms of trying to fret notes and eventually form chords. For the would-be first time electric guitarist, it’s also smart to discuss and demonstrate the importance of playing at proper volume levels-whether with an amplifier or with headphones-and being courteous to the other family members. Classical. It’s easy for the classical guitar to get lost in the list of possible first guitars, and that’s a bit of a shame. The nylon strings seem less intimidating (I caution students that their fingers will still hurt), the wider fingerboard often helps to cleanly fret notes, and the smaller body size usually allows most players to develop better posture and positioning. The guitar is a highly personal instrument. One can learn the basics on any type of guitar, but a student who loves his or her instrument will usually play (and practice) more than one who’s hoping for a different guitar. As teachers and guitarists, we know that the first guitar is simply that-a first guitar, one of many more to come. People take pride in their instruments as well as in their achievements as students. By helping students choose the right guitar, one that they will want to play, you’re helping to get them started on a lifetime’s adventure. The key thing to remember about the first guitar is that, above all, it should encourage the student to play at every opportunity. Make certain that it fits the student both in terms of size and personality and that the instrument is set up as well for the student as it can possibly be. 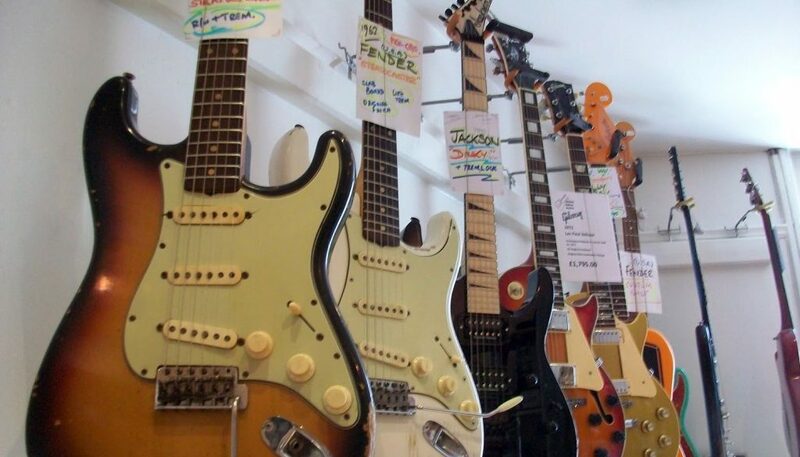 Remember to check out our Guitar Buying FAQ and the topic page on buying guitars and other equipment. I always thought it was best to start on acoustic for two reasons. 1. You can take it anywhere and play it. 2. It’s a LOT easier to go from playing a steel-string acoustic to playing, well, anything else really than to go from say an electric to an acoustic. If you’re used to the ease of playing an electric, acoustic’s going to be a struggle. Let’s be frank here, learning to play the guitar is hard. There are even times now, that I feel like giving up and I have been playing for over 20 years. In my opinion, you should choose the type of guitar that you like to listen to. Let’s face it we all start learning to play because we fall in love with a particular artist / group and want to play like them. If you want to learn guitar because you want to play like Eddie Van Halen, getting an acoustic is possibly going to be a bit frustrating. I have to agree with mat that learning on an acoustic is the way to go if only for the fact that you can take and play it anywhere and it gives you a great starting point to move into other instruments if and when you feel like it. I’ve always thought that acoustic is the way to go when beginning. It’s cheaper, and it pushes your finger strength, dexterity, etc. I’ve got nothing wrong with beginners using the electric but its best to start on the acoustic. Steel String Acoustic for me. I think trying to write music on any other type of guitar CAN BE limiting. I agree with Sam. So much more scope with the acoustic! If there were no electric guitars, only acoustic, I would never have picked one up. Acoustics just did not interest me at all. reason for starting electric was because I really liked rock and blues and The Stones was and still is my favorite band. Much later I bought my first acoustic and possibly because I had played for a number of years I did not find it very hard. to sound like an acoustic + much, much more. You might actually get carried away from what the guitar is all about!